After the transit of the Panama Canal and a challenging ocean passage with weak, variable and often contrary winds, the entire Pacific Odyssey fleet finally found itself at anchor in front of Puerto Baquerizo Moreno on the island of San Cristobal. 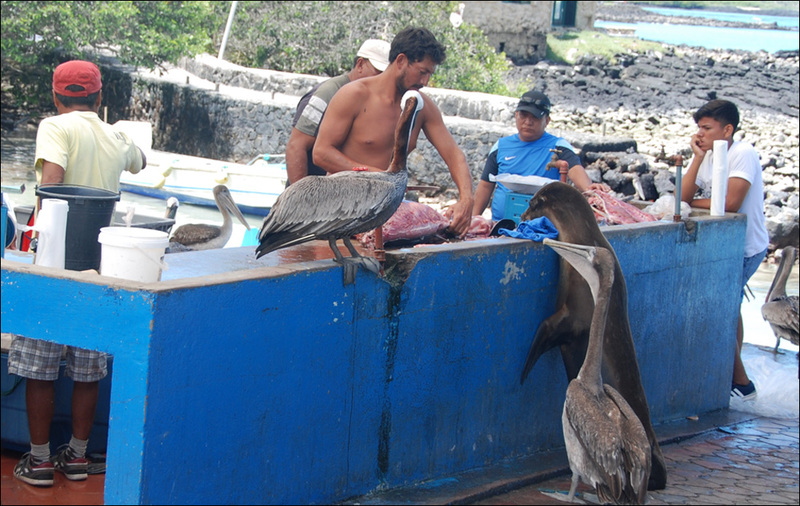 Each boat submitted to the strict regulations which are enforced on arrival in the Galapagos, and received onboard inspections from all the different official agencies (up to 12 personnel at any one time). Having followed the advance notice given concerning the necessary preparations to the letter, most notably being sure to have an impeccably clean hull, all the boats completed their entry formalities without any problems. Mural welcoming visitors arriving at Puerto Baquerizo Moreno. 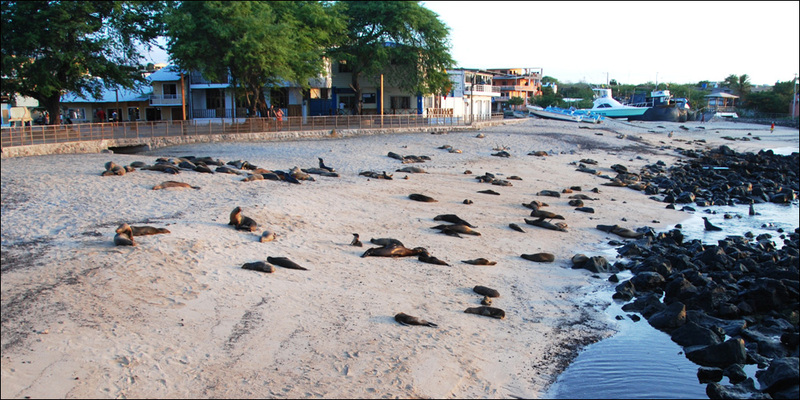 The first week was spent on the island of San Cristobal, allowing everyone to discover the unique Galapagos wildlife, beginning with the ubiquitous sealions which climb onto the boats in the bay, as well as crowding the beaches and even occupying local village benches! Galapagos sealions on the village beach. 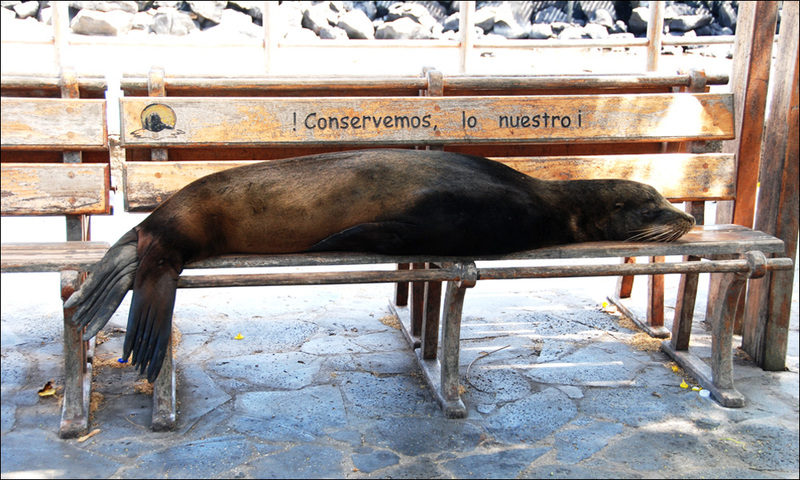 Sealions enjoy the public benches. 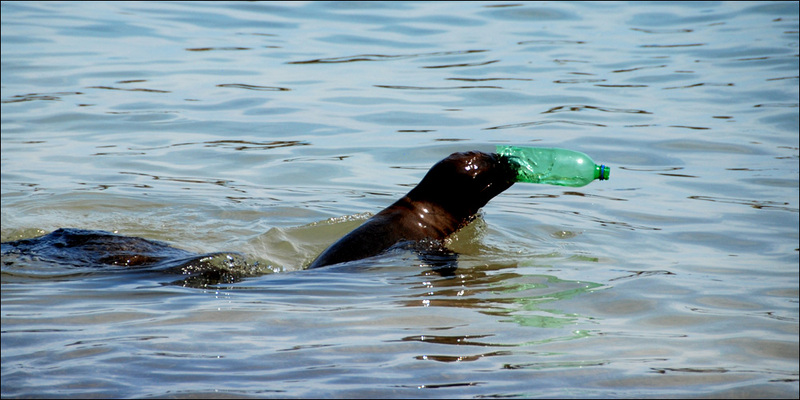 A sealion plays with a plastic bottle in the bay. 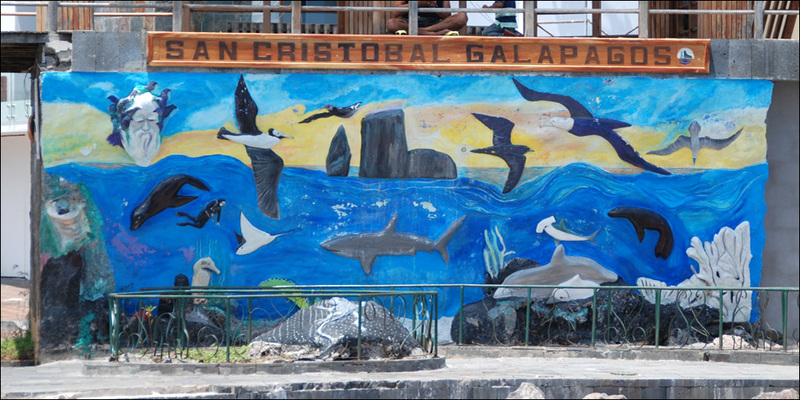 There is still much work that has to be done to protect the environment and raise awareness, even in the Galapagos. 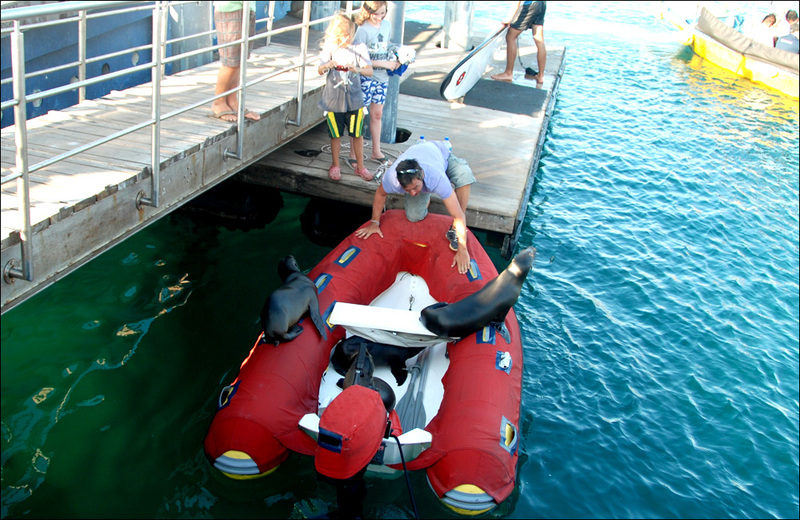 Gilles, from catamaran Mercredi Soir, fights the sealions to regain possession of his dinghy. A varied and exciting programme of activities was organised for the sailors, with day trips, diving, snorkelling and surfing excursions, as well as get-togethers in the local bars and restaurants. 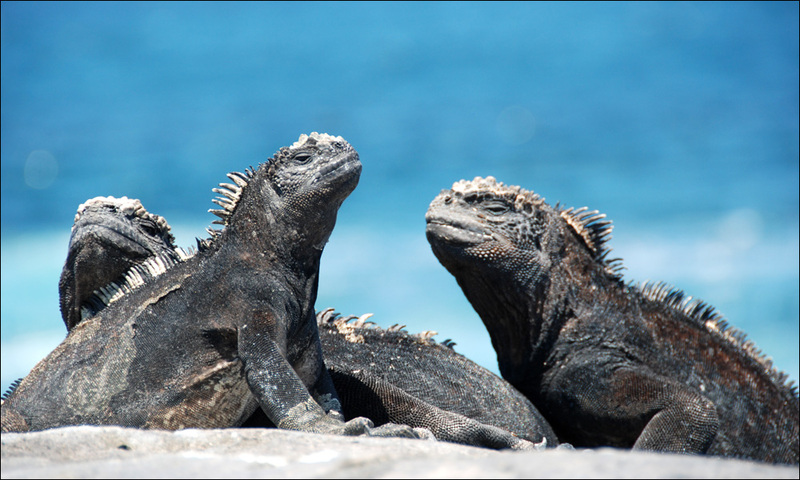 Marine iguanas of the Galapagos. 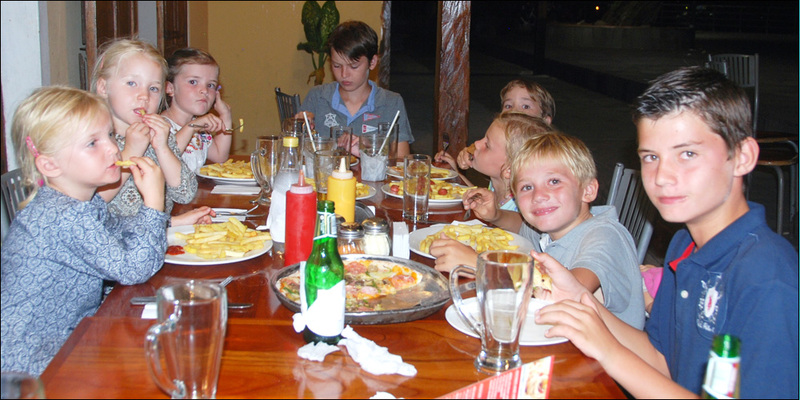 The Odyssey kids enjoy a pizza while discussing their adventures. 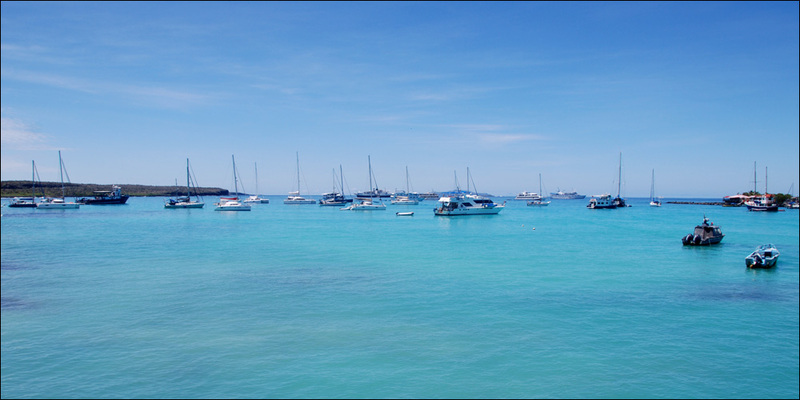 A short day-hop with very little wind took the boats across to the island of Santa Cruz, to Puerto Ayora anchorage. A change of scenery, with a chance to take part in similar activities, as well as a welcome final chance to stock up on provisions before the long Pacific crossing, with the next supermarket and fresh produce market lying more than 6000 km to the west. Academy Bay anchorage in Puerto Ayora, on the island of Santa Cruz. Tortoises at the Darwin Institute in Puerto Ayora. Three local customers doing their shopping at the fish market. The Pacific Odyssey boats are now spending time getting acquainted with Isabela, which as the largest of the islands in the archipelago, is also the least developed and spectacularly scenic. In a few days, each boat will set off for a long passage westwards, bound for the Polynesian islands of the Marquesas. Follow the position of the boats on the tracking map. 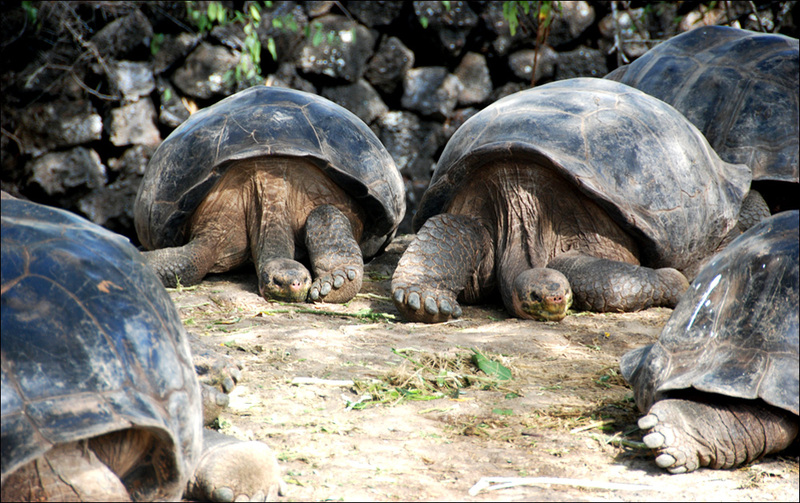 Find out more about the Galapagos. Main threats and issues facing the Galapagos Islands.